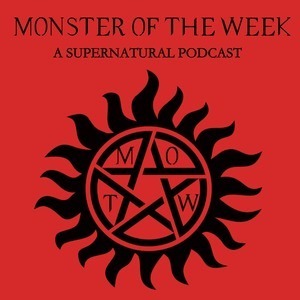 127 episodes of Monster Of The Week: A Supernatural Podcast since the first episode, which aired on December 25th, 2016. Chris and Jeremy talk about S09E02 and a whole lot of other stuff you shouldn't listen to without adult supervision. Chris and Jeremy open up Season 9 and get DIRTY. Chris, Jeremy, and Roxie discuss Supernatural, the S8 finale, and play a fun lil game of F/M/K. Jeremy and Chris wrap up S8 and ask the important question: where has all this acting been? Chris and Jeremy go in deep on the mythical character of "Ryan"
Jeremy and Chris talk about why Charlie is SO GOOD on Supernatural. Big Kicks Sam comes in and kicks all over the place. Jeremy and Chris discuss Krissy Benjamin Button'ing her way through this episode. It took 100 episodes but Chris and Jeremy finally ruined the podcast. Jeremy and Chris discuss old, dumb gods.